As early as the ancient city of Babylon in 4300 BC, beer been a strong element of civilization. The Babylonians brewed approximately 20 different varieties of beer from the grains at their disposal, and today, we have access to millions. Beer consumption has been on an upward trend in the most recent decade, and naturally, more people have expressed interest in having a beer brewing kit of their own. 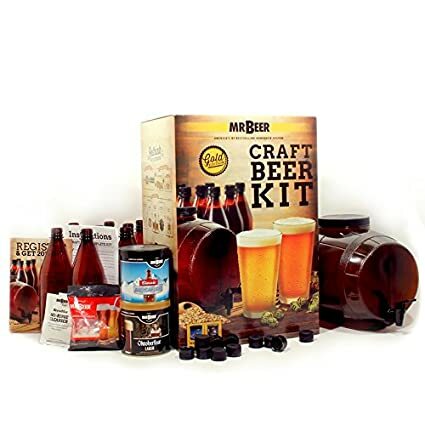 The following brewing kits are some of the best reviewed and highest-quality options on the market for hobbyists and veterans alike looking to quench their thirst and hone their skills. 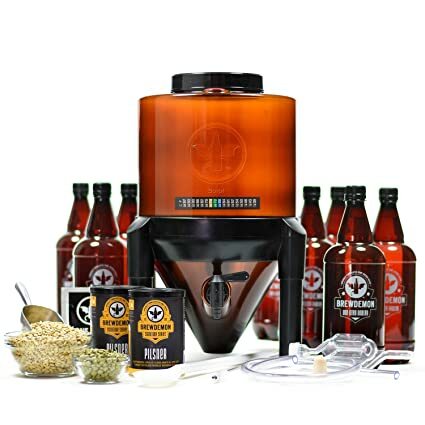 The BrewDemon Signature Beer Kit is capable of making 2 gallons of beer in just two weeks. The reusable kit features the very first small batch conical fermenter in the world, along with the most popular BrewDemon all-malt recipe (4.6% ABV). With the conical filter, owners have the ability to create brew that could potentially be on par with what’s produced by the professionals in the industry, albeit in slightly lower quantities. To suit the user’s needs for customization, the BrewDemon Signature Kit’s spigot can be freely adjusted. In addition to the adjustable spigot, users also have the convenience of a stick-on temperature gauge and a venting gauge. There are eight reusable Amber 1-liter plastic bottles, caps, labels, mixing spoons, bottle fillers, and hoses included as well. All of the parts are manufactured in the USA, while the malts are handcrafted at the Speight’s Brewery in New Zealand. Owners should be advised that neither the bottles not the kit pieces themselves are not dishwasher-safe. The conical filter, just like the bottles, is made of hard plastic. The fermenter has a large volume and a much wider cap compared to the fermenters commonly found in cheaper kits. Thanks to the conical design, the waste is trapped at the bottom of the fermenter during the brewing process. The fermenter was specially designed to be able to handle 2.5 gallon recipes. The BrewDemon Signature Kit can be used to brew any style of beer that the owner desires. Irish stout, hard cider, mead, wine and even hard liquor like gin can all be easily produced with the fermenter. The kit comes with just about everything that the owner needs to brew their very first batch, save for a 3-quart pot and a minor amount of granulated sugar to complete recipes. Owners can get a visual on the active fermentation by using a standard air lock that comes included with the entire package. Some owners opt to using a water style lock as opposed to the standard air lock, though it’s largely more a matter of preference than objective quality. If desired, the owner might also choose to upgrade the standard air lock to blow-off tube. Once the beer has been completed and poured into the plastic bottles, the bottles can generally be kept in cold storage for up to six months. Naturally, the lifespan is going to depend in part on the particular alcohol level of the beer brewed by the owner. One customer testified that they were initially interested in the BrewDemon Signature Kit because of the way that the conical fermenter can conveniently hold the trub created by the brewing process. The owner didn’t want to buy a large conical tank because its price and large space requirements, so a small conical fermenter was exactly what they needed. After getting the Signature Kit, they were convinced that the only thing the kit doesn’t include for the perfect brewing experience is the owner’s own patience. Another customer expressed the much-echoed testimony in favor of the small conical fermenter. The customer was able to make their first batch of IPA with no difficulty at all, but at the same time, they stated that prospective buyers should be wary of very strict sanitation requirements to keep the kit clean. From what the customer observed, it could be very easy for a more negligent owner to let the kit become overrun with mold spores if they weren’t vigilant in keeping the kit clean at all times. The customer never allowed their kit to get compromised by pathogens from poor sanitation, and because of this, they could go on their IPA-brewing journey smoothly. One customer found that they appreciated the way that the kit itself was configured, but at the same time, they experienced some uncertainty with the constitution of the bottles. From the customer’s own account, the plastic of the 8 bottles included with the kit were slightly thinner than what they were used to. Prospective buyers who are used to bottles with thick plastic may want to be aware of the chance that the BrewDemon Signature Kit’s bottles might be slightly thinner than anticipated. Perhaps one of the biggest advantages provided by the kit is the opportunity that it presents for brewers to gradually develop their skills. Much like a high-end espresso machine, this high-end brewing kits comes with tools meant to transform a novice brewer into a connoisseur over time. The kit is not terribly complex or demanding to get acclimated to and maintain, which makes it a popular choice for beginners and hobbyists. The Gold Complete Beer Kit features a glass carboy. With the glass carboy, users may have a better ability to create smoother brews. The glass carboy’s contribution to the brewing process is “secondary fermentation”, essentially taking the finished product and allowing it to continue aging in a separate container for several additional days or months; this is a meticulous exercise that the more thorough brewers will appreciate the most. As pathogen infestation is one of the biggest inherent risks of any brewing project, especially with secondary fermentation, a degree of competence in keeping the glass carboy clean is essential. Included with the Gold Complete Beer Kit are a brewing handbook and kit instructions, which can help get the more inexperienced brewers up to speed relatively quickly. The fermenting bucket has a 7.8-gallon fluid capacity, and it’s been drilled with a grommet. For added convenience, there’s a true brew rack with a fill kit. Since the ideal fermentation temperature will vary between things such as ales and lagers, there is a fermentation thermometer included to help owners stay on track. A small buon vino drilled stopper is included so that owners can have a reliable way of sealing their glass carboy when it’s time for secondary fermentation. To assure that they can produce the healthiest and most successful brew, owners will want to keep track of the rate that yeast is converting their sugar into ethanol; to make this more manageable, a hydrometer is included among the materials. The other essential tools included with the kit are a bottle spigot, an Emily Double Lever Capper, a 3-piece airlock, a bottle brush, and a C-Brite sanitizer 8-pack. With the C-Brite sanitizer pack, owners have a reliable no-rinse solution to keep their brewing process consistently hygienic. Customers should be advised that the kit does not include a pot to boil all of their ingredients in. The Gold Complete Beer Kit bucket has been certified as food grade & BPA free. One customer testified that she purchased the kit as a Christmas present for her boyfriend, though neither of them had any significant experience in the actual process of brewing their own beer. Upon first receiving the kit, they found that the standard airlock included with the kit had a slight crack on the side. After emailing the manufacturer about the problem, they were sent 5 replacement airlocks from the seller. Once the couple got to work brewing their very first batch of beer, they were pleased to find that the kit made the process very easy. The siphoning hose in particular was what they said made it so possible to get the exact amount of beer in each bottle, and there were no issues with the bottle capper. Another customer testified that the Gold Complete Beer Kit is a fine choice for users who are just looking to start out their brewing hobby and possibly go even further beyond the beginner level. They stared that they were surprised about the cleanser being contained in a large tub instead of only a packet, as well as the fill wand being spring-loaded. The customer did advise, however, that prospective buyers consider investing in a 5-gallon stainless steel pot with a glass lid. The customer also suggested getting a basic digital thermometer and a large mesh strainer to make the brewing process more seamless altogether. Overall, the couple only wound up having to go out and buy just a few extra tools at their discretion; at the same time, they were confident that the basic essentials for successfully creating a perfectly fine batch of beer are all included in the Gold Complete Beer Kit by default. The BSD Gold Beer Homebrew Kit, like the Gold Complete Beer Kit, comes with a glass carboy to give the owner secondary fermentation functionality. As made evident in the product’s name, the glass carboy included in the BSD Gold Beer kit has a 6-gallon capacity. Overall, the kit has been designed for a batch capacity of around 5 gallons. The kit has been designed in such a way that any alcoholic recipe can be seamlessly executed through the included tools. Like other all-inclusive beer kid models, there are instructions included to help the less-experienced brewers get up to speed with minimal difficulty. Additional tools include a 7.8 gallon drilled fermenting bucket with a grommet, a fermentation thermometer, a small buon vino drilled stopper, a bottling spigot, a double lever capper, a 3-piece airlock, bottle brush, and C-Brite sanitizer 8-pack. The hydrometer included in the BSD Gold Beer Homebrew Kit includes a triple scale hydrometer, giving owners an increased capability of keeping an accurate account of the fermentation process. When the owner opens up the box for the first time, they’ll be able to use the instructions to walk them through the assembly process without any setup hassle. The kit includes all of the necessary tools for completing just about any brewing recipe, but the actual recipe kits will need to be purchased separately from the BSD Gold Beer Homebrew Kit itself. One customer suggested that in addition to buying recipe kits to use with the homebrew kit, prospective buyers should also make a point to invest in a bottle washer and stand capper. While they believed that the hand capper in the kit works well, having to manually cap dozens of bottles could get exhausting before very long. Standard cappers are not only less demanding, but also hold the bottles in place so that owners are less likely to miss a cap or create unwanted spills. While the kit doesn’t have a conical fermenter, the bottling bucket included with the ingredients can double as the primary fermenter if desired. There is no auto siphon included in the supplies, but the siphon hose is compatible with most auto siphons available on the market. Even without the inclusion of an auto siphon by default, some customers find that the bottling wand and the racking cane make up for it. It is possible to use the kit for making wine just as easily as it can be used for making beer, but in order to do so, a few additional instruments will have to be purchased at the owner’s expense. The capper included in the BSD Gold Beer Homebrew Kit is made for easily opening beer bottles, but it won’t be able to open wine bottles. If the owner doesn’t have one already, then they’ll have to buy a wine corker or use a hammer to knock the corks into position. Prospective buyers should also be advised that the kit doesn’t come with its own supply of yeast, and one owner suggests that the best kind of yeast to invest in would be EC 1118 for wine and mead. The owner also suggested that some buyers may want to consider replacing the standard plastic bucket with another carboy. Overall, the kit is a respectable starter set for new brewers looking to test their mettle in the craft. It doesn’t include all of the bells and whistles of higher-end kits, but it still provides the basic essentials for getting a successful batch of Irish Stout off the ground. The Mr. Beer Gold Beer Kit comes with a dual pair of lightweight kegs that have been made for shatter resistance and reusability. With the kits’ All Malt refills, customers will be able to homebrew up to 4 gallons of beer at a time. The kit also includes 11 reusable bottles, and each reusable bottle is approximately 740 milliliters, with caps and labels included. Environmentally-conscious customers will be pleased to know that the plastic composing the kegs is BPA free and won’t hinder the taste of the beer with any unpleasant flavor migration. In addition to the keg plastic being BPA free, each Mr. Beer Refill is completely natural and GMO free. 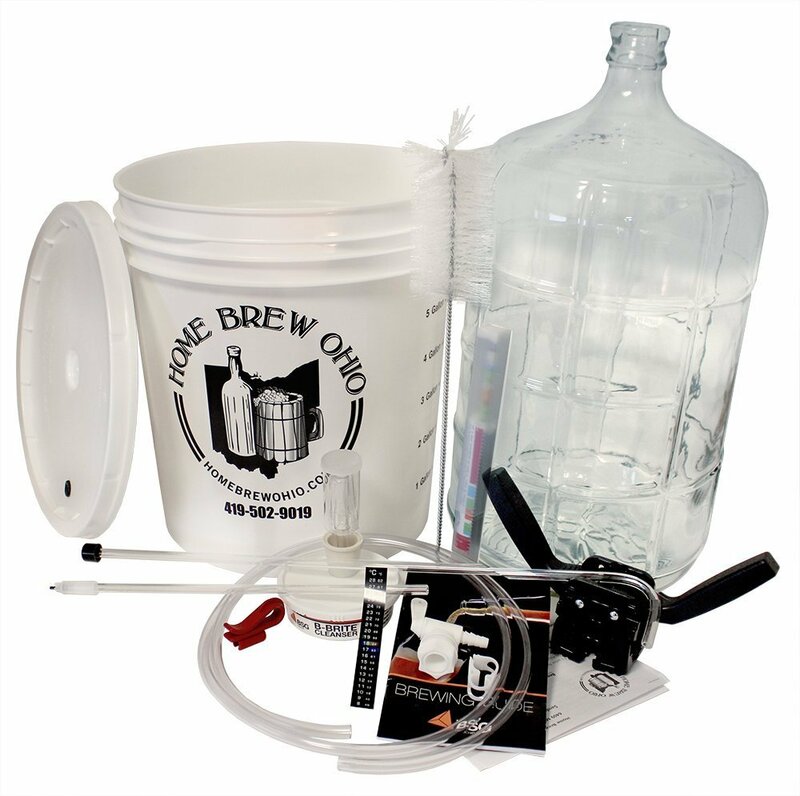 The 2-gallon fermenter included with the kit is made from plastic that is compliant with FDA regulations, along with having a wide mouth to optimize the ease of cleaning it. The average ABV of all brews produced by the Mr. Beer Gold Kit will be around 3.7%. To make it easy for new brewers to accustomed to brewing, the Mr. Beer Gold kit comes with an easily-followed instruction booklet. The kit is relatively low maintenance and won’t require newer users to go very far out of their way to have the bare minimum requirements to start brewing. For more convenience, there are a selection of beer mixes included with the kit parts. The Mr. Beer Aztec refill is a Mexican-style brew, and Czech Pilsner refill is a pale malt with a spicy and dry finish. Unlike the Brewmasters kit, which comes with craft beer refills, the Premium Gold kit comes with standard beer refills. Standard beers are more along the Coors and Miller route, while craft beers are along the microbrew route. The kit also includes patented Mr. Beer Carbonation Drops. Two carbonation drops into the one of the 740 milliliter bottles should be adequate enough to fully carbonate the entire brew without overwhelming the flavor altogether. Customers are strongly advised to hand-wash the keg and bottles in warm water only. The only soap used in the cleaning process should be the mild, unscented kind. Owners should make a point to refrain from using dish soap to clean their Mr. Beer Kit parts, as dish soap may potentially corrode the material; for the same reason, owners should refrain from using wire brushes, scouring pads, or any kind of abrasive cleaning instrument. One of the key questions that a smart brewing kit shopper will ask themselves at the beginning of their search is, “what should I actually be using to ferment my brew in first place?” Many brewing kits come with different sizes and types of fermenters, and depending on your preference, some may certainly be better choices than others. The first factor to examine is the size of the fermenter that you’ll need. Some fermenters can be as small as 2 gallons (generally just for testing out experimental batches), while other options can be as massive as 100 gallons. The size of the fermenter that you get will directly affect the type of resulting fermentation, so it’s wise to invest as much time as you need in thinking about what your personal requirements are. In most starter brewing kits, the average fermenter for making a standard batch will usually need to be slightly bigger than 5 gallons to handle the bacterial buildup from a 5-gallon batch. The general starter kit fermenter sizes will between 3 gallons and 6.5 gallons. Always aim to have the fermenter be slightly larger than the actual gallons of the batch you’re planning on brewing, as the extra room can become essential for containing excess foam. You’re going to want to make sure to minimize the amount of air that could come into contact with the beer through the mouth of the fermenter. In general, the plastic fermenters will be the cheapest and most readily-available fermenters found in standard brewing kits. The most high-end brewing kits, on the other hand, will generally feature a fermenter of hi-grade stainless steel in the shape of a conical tank. The overall range of different fermenter materials includes (but is not limited to) the following: food grade plastic, plastic carboys, high density polyethylene containers (HDPE), glass carboys, P.E.R. stainless steel, and Sanke kegs. Plastic fermentation buckets, the most affordable choice, are usually ready to sanitize right out of the box. They will usually be built with one hole that functions as the air lock, and another hole that can work as a spigot for draining without the need for a siphon. Plastic buckets are lightweight and easy to find, but they’re harder to keep clean, scratch easily, and some people claim they may have an adverse effect on the brew’s taste. Glass carboys are heavier and more breakable, but they offer more protection for the brew against oxygen, won’t scratch, and are easier to clean. Before jumping right into a brewing frenzy, you’ll want to make sure that you have a clear picture of exactly what kind of beverages you plan on brewing. It may seem self-explanatory, but different brewing kits are differently optimized for making certain types of brew. Generally speaking, most brew kits will be capable of making anything from wines, to craft beers, to hard liquors; however, certain brew kits will tend to create beverages with a higher or lower ABV. You will want to make sure that you don’t wind up investing too much into a brew kit that isn’t meant to create beverages with the same level of alcohol concentration that you’re personally looking for. The more expensive kits will tend to be better-suited for creating microbrews, while the less expensive kits will be more in-line with the needs of users who are interested in creating standard brews. Depending on the kinds of beverages that you plan on making, the hard tools that you’ll need for the process will vary as well. If you plan on making wine, then naturally, a wine stopper will need to be on the list of auxiliary materials that you purchase alongside your kit. Depending on how thoroughly you’d like to create your brew, you may be interested in more than just the standard fermentation process. 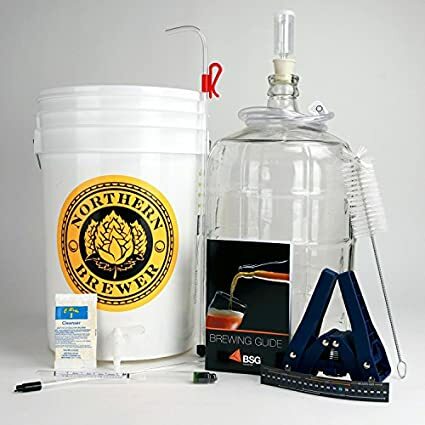 Experienced brewers understand that nothing is more imperative to the final quality of the brew than ensuring that the brew remains properly sanitized at all times; this is doubly true when it comes to secondary fermentation with a glass carboy. With a carboy, you’ll have the ability to put your brew through a secondary fermentation process, which will last for a time that’s completely up to your discretion. The necessity of the secondary fermentation process will largely depend on your own time constraints and your level of attention to detail. In addition to keeping the brew germ-free, you’ll also be potentially exposing the fermented beer to oxygen, which could very quickly flatten the flavor. If you’re not the type of person who enjoys micromanaging things with laser-like accuracy, or generally just not a fan of tidying things up, then the secondary brewing process may not exactly be the best choice for your brewing endeavors. If you do have a gift for staying on top of the fine details, however, then secondary fermentation could be right up your alley. When you’re picking between either a higher-end or slightly more modest brewing kit, an important thing to consider is just how many of the deluxe kit’s accessories you’ll need. For the most part, brewing kits will include the following items in the package by default: a hydrometer, a fermenter, a bottling bucket, hydrometer, thermometer, a hose siphon, an airlock, and a sanitizer. The standard options are fine and well for bare minimum brewing, but certain tools can streamline the process even further depending on your preferences. An auto-siphon isn’t always offered by default, but when it is, it can make the filling process much more intuitive. Standing cappers can ease up the strain of having to use the manually cappers repeatedly. Some brewers may prefer to use a digital thermometer as opposed to the standard thermometers included in the brew kit’s basic supplies. The additional features could very well end up saving you money by facilitating a brewing process that is more difficult to do incorrectly, which would mean less time and beer mix wasted due to careless mistakes. To make the most intelligent purchase, invest some time into understanding exactly what features you do and don’t need – this will be slightly contingent upon your level of experience, but also largely a matter of preference. Brewing kits can offer a swiftly rewarding and educational experience for novices and experts alike, but the best possible decision can only be made with all of the proper precautions. The best brewing kits will generally come with tools that go above and beyond the bare minimum required to start a batch set, including auto-siphons and conical fermenters. Before buying, make sure that the kit’s ABV and materials include exactly what you need to make the drinks you’re interested in.